A potentiometer is a manually adjustable variable resistor with 3 terminals. Two terminals are connected to both ends of a resistive element, and the third terminal connects to a sliding contact, called a wiper, moving over the resistive element. The position of the wiper determines the output voltage of the potentiometer. The potentiometer essentially functions as a variable voltage divider. The resistive element can be seen as two resistors in series(potentiometer resistance), where the wiper position determines the resistance ratio of the first resistor to the second resistor. A potentiometer is also commonly known as a potmeter or pot. The most common form of potmeter is the single turn rotary potmeter. This type of pot is often used in audio volume control (logarithmic taper) as well as many other applications. Different materials are used to construct potentiometers, including carbon composition, cermet, wirewound, conductive plastic or metal film. 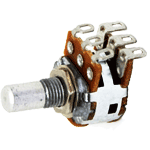 A potentiometer is a manually adjustable, variable resistor with three terminals. Two terminals are connected to a resistive element, the third terminal is connected to an adjustable wiper. The position of the wiper determines the output voltage. A wide variety of potmeters exist. 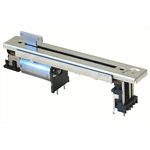 Manually adjustable potmeters can be divided in rotary or linear movement types. The tables below list the available types and their applications. Besides manually adjustable pots, also electronically controlled potentiometers exist, often called digital potmeters. The most common type of potentiometer where the wiper moves along a circular path. Single-turn pot Single rotation of approximately 270 degrees or 3/4 of a full turn Most common pot, used in applications where a single turn provides enough control resolution. Multi-turn pot Multiple rotations (mostly 5, 10 or 20), for increased precision. They are constructed either with a wiper that follows a spiral or helix form, or by using a worm-gear. Used where high precision and resolution is required. The worm-gear multi turn pots are often used as trimpots on PCB. Dual-gang pot Two potentiometer combined on the same shaft, enabling the parallel setting of two channels. Most common are single turn potentiometers with equal resistance and taper. More than two gangs are possible but not very common. Used in for example stereo audio volume control or other applications where 2 channels have to be adjusted in parallel. Concentric pot Dual potmeter, where the two potentiometers are individually adjusted by means of concentric shafts. Enables the use of two controls on one unit. Often encountered in (older) car radios, where the volume and tone controls are combined. Servo pot A motorized potmeter which can also be automatically adjusted by a servo motor. Used where manual and automatic adjustment is required. Often seen in audio equipment, where the remote-control can turn the volume control knob. Potentiometers where the wiper moves along a linear path. Also known as slider, slide pot or fader. Slide pot Single linear slider potentiometer, for audio applications also known as a fader. High quality faders are often constructed from conductive plastic. 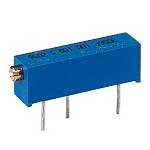 For single channel control or measurement of distance. Dual-slide pot Dual slide potentiometer, single slider controlling two potentiometers in parallel. Often used for stereo control in professional audio or other applications where dual parallel channels are controlled. Multi-turn slide Constructed from a spindle which actuates a linear potentiometer wiper. Multiple rotations (mostly 5, 10 or 20), for increased precision. Used where high precision and resolution is required. The multi turn linear pots are used as trimpots on PCB, but not as common as the worm-gear trimmer potentiometer. Motorized fader Fader which can be automatically adjusted by a servo motor. Used where manual and automatic adjustment is required. Common in studio audio mixers, where the servo faders can be automatically moved to a saved configuration. Digital potentiometers are potentiometers which are controlled electronically. In most cases they exist of an array of small resistive components in series. Every resistive element is equiped with a switch which can serve as the tap-off point or virtual wiper position. A digital potmeter can be controlled by for example up/down signals or protocols like I²C and SPI. 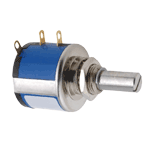 A potentiometer can also be wired as a rheostat, or single variable resistance. The best way to wire a potentiometer as a rheostat is to connect the wiper and one end terminal together, this prevents infinte resistance if the wiper occasionally loses contact. More information can be found on the dedicated page about rheostats. Carbon composition Carbon composition ink molded on a substrate(phenolic resin). Most common material, low cost and reasonable noise and wear characteristics. Wirewound Wirewound pots can handle high power,are long lasting and can be very precise. They have however a limited resolution and rough feel. Most used in high power applications (rheostats are often wirewound) or as precision pots. Conductive plastic Very smooth feel and high resolution, can be constructed to perform millions of cycles. Can only handle a limited power and are expensive. Often used in high-end (audio) equipment where a high resolution and low noise are important. Cermet Very stable, low temperature coefficient and handles high temperatures well. On the other hand quite expensive and often limited amount of cylces allowed(special long-life cermet pots also exist). Often used for trimpots which do not have to be adjusted often. Because potmeters are variable there is no need for a wide range of values. While potentiometers can be manufactured in every resistance value you can think of, most potmeters have values in the following range of multiples. By far the most used value for potentiometers is 10 kOhm other very common values are 1k, 5k and 100k. The potentiometer taper is the relationship between the mechanical position and resistance ratio. Linear taper and logarithmic(audio) taper are the most common forms of taper. 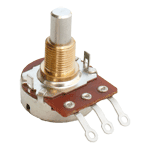 For more information visit the dedicated page about potentiometer taper. Potentiometers values are often marked with a readable string indicating the total resistance, such as “100k” for a 100 kOhm potentiometer. Sometimes a 3 digit coding system similar to smd resistor coding is used. In this system the first digits indicate the value and the last digit indicates the multiplier. For example a 1 kOhm would be coded as 102, meaning 10Ω x 102 = 1 kΩ. 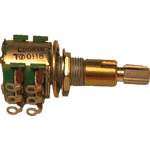 The taper of a potentiometer is normally indicated with a letter. The following table lists the used coding for potentiometer taper, different standards uses the same letters which can be confusing. It is always a good idea to double check the taper by measurement. The resolution of a potentiometer is the the smallest possible change in resistance ratio. Wirewound resistors often have a lower resolution because the wire turns introduce discrete steps in resistance. Conductive plastic potmeters have the best resolution. The resolution can be influenced by the wiper configuration, a wiper consisting of several spread contact points increases the potentiometer resolution. At the start and end of travel, the resistive track of a potentiometer is connected to low resistance metal parts which connect the resistive element to the end terminals. The change in resistance when the wiper enters or exits the resistive track is known as the hop-on and hop-off resistance. 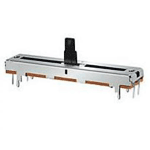 Potentiometers are used in a very wide range of industries and applications, it would be difficult to list all applications here. It can be used as a control input, position measurement or calibration component and much more. Where a variable input from the user of a machine or application is required, potentiometers are often used. In automotive applications, the throttle pedal is often a potentiometer, normally this is a dual gang pot to increase redundancy of the system. Another application of pots are joysticks for machine control. Volume control is often performed with a (motorized) potentiometer in audio applications. For balance control a dual-gang potentiometer can be used, where on gang has a logarithmic taper and the other gang has an inverse logarithmic taper. In professional audio equipment, faders are often used. Potentiometers are often used as a position or angle transducer to measure distances or angles. In fabrication and calibration, trimpots are often used. Trimpots are preset potentiometers which are often mounted on a circuit board and can be used to tune or adjust the circuits performance. They are used only during calibration of the system and are at a fixed position most of the time. Trimpots are often actuated by a small flat-head screwdriver. Trimpots are also known as presets, trimmers or trimming potentiometers. The following symbol is used for a potentiometer. The potentiometer symbol on the left is according to the IEC standard. The potmeter symbol on the right is according to the old American standard. 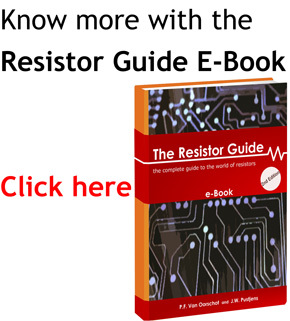 An overview of resistor symbols is also available on the resistorguide.